The best thing about entertainment mediums is the escapism that they provide. Through words spoken or written, music played or sung, and action described or presented, each one transports us to an interesting time, place, event, or memory, regularly evoking emotion and feeling. It goes without saying that video games are a great example of this, with immersion being one of their main selling points and most memorable attributes. Let’s take BioShock for example. A series inspired by popular fiction, its first two entries transported gamers to an underwater dystopia known as Rapture. Actually, the word dystopia is an understatement, as those who’ve played the games will surely agree, but we’ll stick with it. In truth, the separated region is one of gaming’s most unique and memorable locations, not to mention one of its most intense. With religious subtext and an underlying message relating to humanity’s search of perfection, the digitally crafted environment ended up becoming a character in its own right. 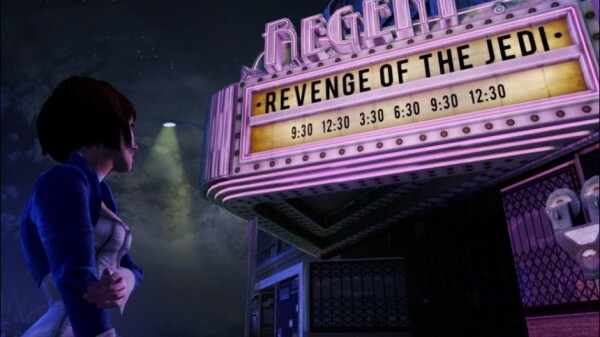 After two trips to Rapture, Irrational Games has decided to change things up with its next entry into the widely popular first-person shooter franchise, by sending players to a brand new and thoroughly unique city known as Columbia. Separated from earth and situated within the clouds, the floating city is ripe with intrigue, history and visceral attributes befitting its 1912 setting. As such, it won’t end up surprising me if Columbia ends up becoming a fan favourite following the release of the game in which it’s featured. 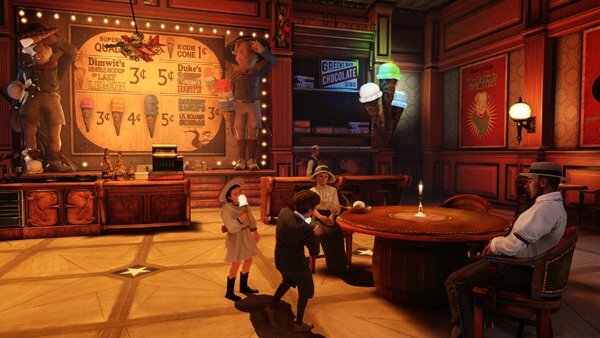 That would be BioShock: Infinite, which will hit North American store shelves on March 26. Thanks to Microsoft’s Spring 2013 X-Series preview event, I was provided with a great opportunity to sit down and play through the opening portion of the beautiful-looking, and hotly anticipated, title. As a result, I’m now able to share my thoughts with you folks, having spent about thirty minutes with it. At the start of the demo, former investigator and main character, Booker DeWitt, is shown as a passenger in a rowboat manned by two raincoat-wearing people. Having undertaken a seemingly lengthy trip to get to where they are, the group rows its way for a couple of minutes before arriving at its destination: an unsuspecting lighthouse situated out in the middle of the ocean. There, the protagonist is dropped off without instruction, and is left to his own devices. Then again, there’s nowhere to go except up the stairs and towards a big door, which bears a personalized note with vague instructions. What follows the opening of that door is something that I do not want to spoil, because it’s an experience that all interested gamers should enjoy without any advance descriptors. However, without spoiling anything, I will tell you that the lighthouse segment is very indicative of the BioShock franchise. 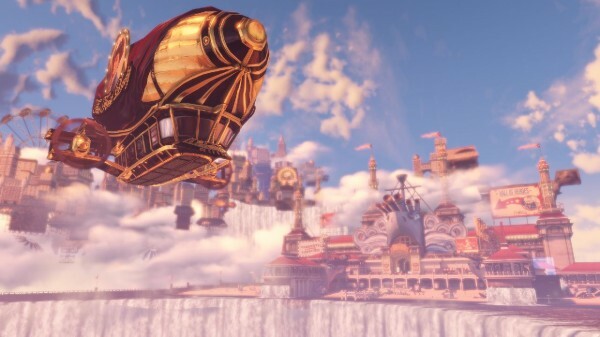 It’s strange, surreal, beautiful and of quality, not to mention memorable, leading Booker DeWitt to the city in the clouds, where he must search for a young woman. Following a series of events that sees Booker outed as an outsider, and a target at that, the protagonist comes into possession of a metallic arm. It’s that Columbia enforcement tool that ends up becoming his first weapon, and a melee one at that. Furthermore, it only takes a handful of moments before players must put it to use against attacking policemen, who want nothing more than to take out their target. Executing a melee attack isn’t a challenge. The only requirement is getting close to an enemy and pressing a face button. Despite being metallic, the arm swings with impressive speed. However, with that being said, only one hit is needed in order to knock out a regular human, which is understandable. As such, I was able to dispatch those inaugural foes with ease, before receiving a pistol later on in the demo. Once I was in Columbia, I tried to explore as much as I could, and ended up finding a lot of interesting things. I found money scattered in places, as well as a lot of health-giving food items to eat and drink. Additionally, hidden voice recordings, historical items and carnival minigames dotted the landscape that I got to explore. Of course, I took the time to partake in one mini-game before moving on, and it provided a nice distraction. A friend did the same, but he played a different game, which seemed to be quite a bit better, as his tasked him with target shooting, while mine tasked me with using a Plasmid to expose a devil hiding behind furniture in a lady’s home. Now that we’re speaking about the Plasmids, I’ll let you know that this early portion of the experience featured two of them: Possession and Devil’s Kiss. Possession, which works on mechanical devices, allowed Booker to take over turrets and steal money from vending machines, while Devil’s Kiss allowed him to throw incendiary grenades. Unsurprisingly, both were helpful during combat situations – especially Possession, because of Columbia’s love of turrets. Whenever I walked near one, it would fire at me, but turning it friendly with the Plasmid forced it to shoot at enemies instead. However, the mechanical takeover spell only lasted for a certain amount of time before fading away, adding strategy into each battle. For the most part, my attacks consisted of melee swipes and pistol bullets, the latter of which came in handy once my foes came with bullet-based protection. Having a gun led to less damage and some easier kills, thanks to gunplay mechanics that felt polished and befitting to this type of game. Don’t expect to be shooting like a Call of Duty soldier, but look forward to solid gunplay mechanics. It’s time to conclude this preview, because we’ve come to the end of what I played, and what I can personally describe. In closing, I’d like to stress how impressive my time with BioShock: Infinite was, and state that I consider it to be a must-buy and must-play release. There’s no doubt in my mind that it will end up being well worth its sixty-dollar price tag.